It's the first human case of plague in Idaho in decades. Here's what you need to know. Earlier this week, state health officials confirmed a case of bubonic plague in a young boy in Elmore County, Idaho. The child is currently recovering from the potentially deadly disease, according to a statement from the Central District Health Department in Boise, Idaho. It is the first human case of plague in Idaho in 26 years. "It appears this case was bubonic plague ... the child had a high fever that prompted his parents to take him to a health care provider where he was treated and tested," Christine Pearson, a spokesperson for the Central District Health Department, told BuzzFeed News in an email. It is unclear whether the child, who has not been publicly identified, contracted the disease in Idaho or on a recent trip to Oregon. In both states, plague has historically been found among rodent populations, such as ground squirrels and mice, but it rarely infects people. There have only been two human cases in Idaho and eight cases in Oregon since 1990. Plague was identified among ground squirrels in Idaho in 2015 and 2016. However, this year there have been no indicators of plague among squirrel populations, such as unusual behavior or die-offs, according to the report. Yes, the plague — the one that wiped out half of Europe's population in the 14th century — is still around. There are a few cases in the Southwestern US each year. The plague, also called the bubonic plague and "Black Death," might sound like an ancient epidemic from history textbooks, but it actually never really went away. Plague cases still occur all over the world today. However, you probably don't hear about it much because the disease is relatively rare and can be treated with antibiotics. Each year, there are about 1,000–2,500 cases of the plague around the world, mostly in Africa, Central Asia, India, and the northern part of South America, according to the US Centers for Disease Control and Prevention (CDC). The most recent outbreak occurred in Madagascar in 2017 — there were 2,417 cases and 209 deaths, according to the World Health Organization. 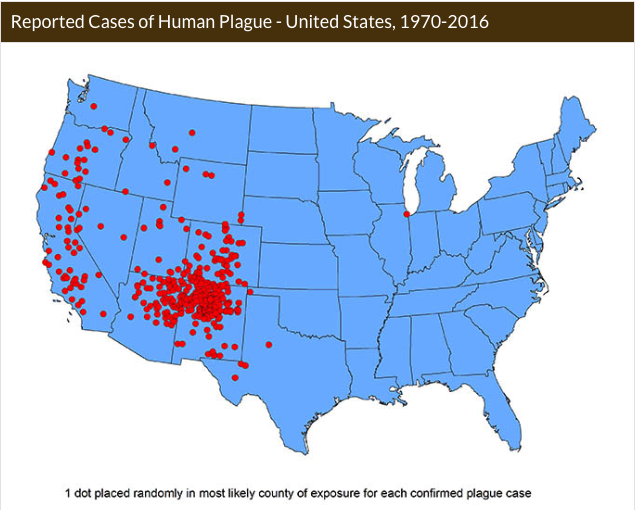 Plague cases also occur in the US, typically in the northern parts of New Mexico and Arizona, Colorado, Oregon, and Nevada. There is an average of seven cases of plague in the US each year. In 2015, a teenage boy in Colorado died from the plague after experiencing flu-like symptoms for a week. Thanks to modern medicine, we are now able to prevent the spread of plague and treat cases before they become potentially life-threatening. 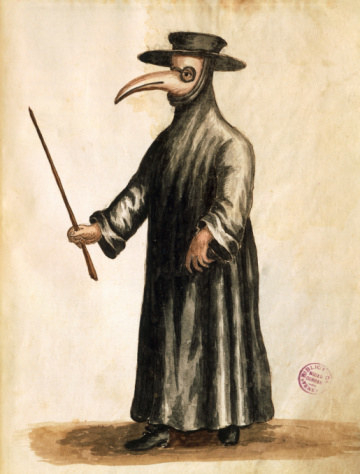 And we no longer have those terrifying "plague doctor" outfits with the bird masks. The plague is caused by a bacteria called Yersinia pestis, which is usually spread to humans from infected fleas or rodents. Plague occurs naturally in certain rodent populations that carry Yersinia pestis. Fleas can pick up the bacteria from the infected animal and pass it to humans by biting their skin. Humans can also get the plague from contact with infected animals and, rarely, from an infected human — but it depends on the type of plague. There are three types: bubonic, pneumonic, and septicemic. Bubonic plague is the most common type, and it's the one spread through the bite of a bacteria-carrying flea or an infected animal. Symptoms include a fever; headache; chills; and swollen, painful lymph nodes (buboes) in the neck, armpit, and groin that can turn into pus-filled sores. Pets also can develop swollen glands under the jaw, in addition to other symptoms like lethargy, loss of appetite, and fever. Septicemic plague occurs when the bacteria enter the bloodstream, and it causes fever, extreme fatigue, stomach pain, hemorrhaging, and acral gangrene, which is a loss of blood flow and tissue death in the fingers or toes, which can cause the skin to turn black. Pneumonic plague is the most contagious and severe form of plague, and it's the type that can spread from person to person or develop when bubonic plague spreads to the lungs, called secondary pneumonic plague. It causes flu-like symptoms in addition to blood-tinged coughing and pneumonia. There is no vaccine for plague, but if it's diagnosed early, it can be treated with antibiotics and supportive care. Plague has a case-fatality rate between 30% and 100%, when there is no treatment, according to the WHO. It's still incredibly rare to contract the plague, but it's always important to take precautions to avoid fleas and rodents. Plague isn't an imminent threat in the US, but you should still take steps to protect yourself and your pets — especially if you live in the Western or Southwestern US. The CDC recommends making your home and workplace rodent-proof and removing rodent habitat areas, avoiding contact with wild rodents, wearing gloves to dispose of rodent carcasses, and using insect repellent with DEET outdoors. You can also decrease your risk by treating your pets for fleas with effective medication and preventing them from hunting or eating rodents in endemic areas.